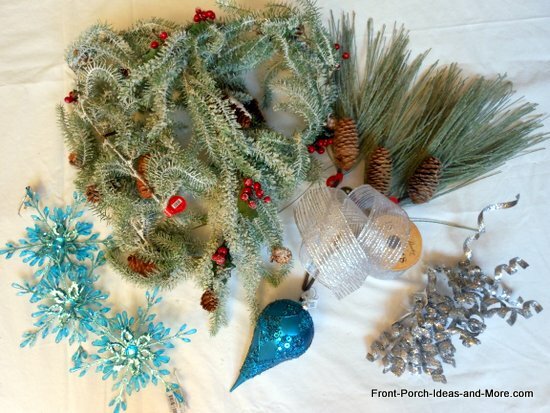 Need some vintage Christmas decorating ideas to help you decorate your front porch for the holidays? Dave and I have gathered some for you. 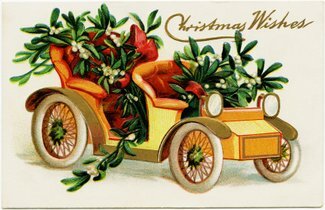 Vintage wagons, old sleds and ice skates, rustic crates, and pastel colored ornaments and baubles are typical of the much-loved vintage decorations we have seen. 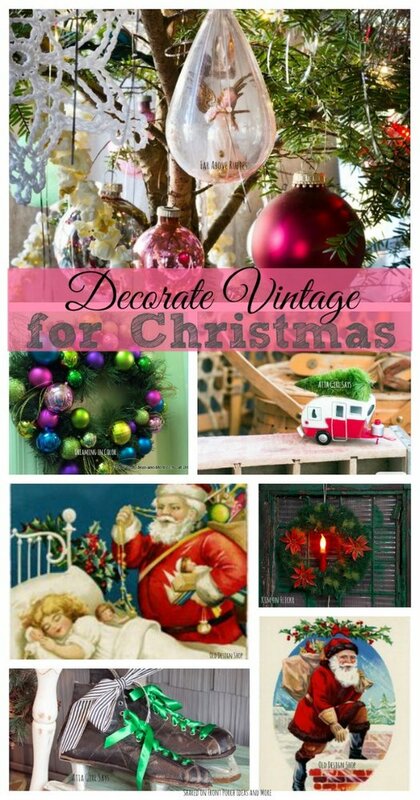 Look at the vintage Christmas decorating ideas we found from several creative bloggers and kind readers. 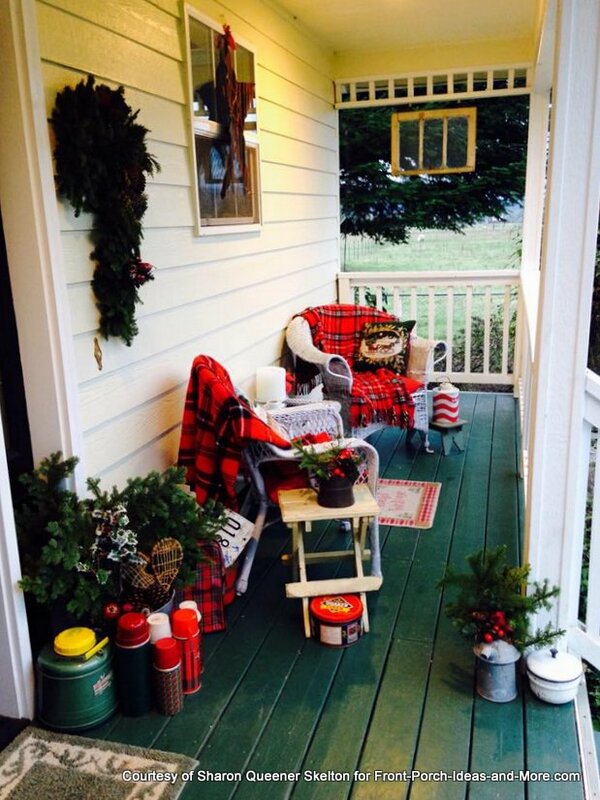 Amy, the author of AttaGirl Says, loves a vintage front porch decorated for Christmas. Take note of all the small details that she included. 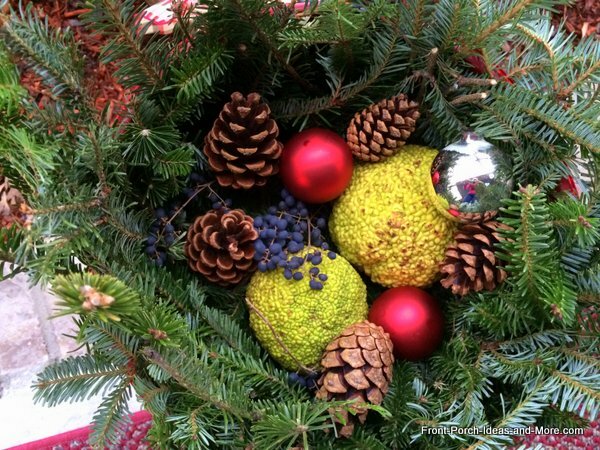 From the top down, you see a fresh greenery wreath tied with white and red ticking ribbon. Just so fresh and pretty. There's a star made of tobacco sticks and a strand of vintage jingle bells across the table. See the skis and poles in the corner? Easy! And how about that vintage sled? If you visit her blog, you'll see that she put a large initial "B" on it with fresh greenery. 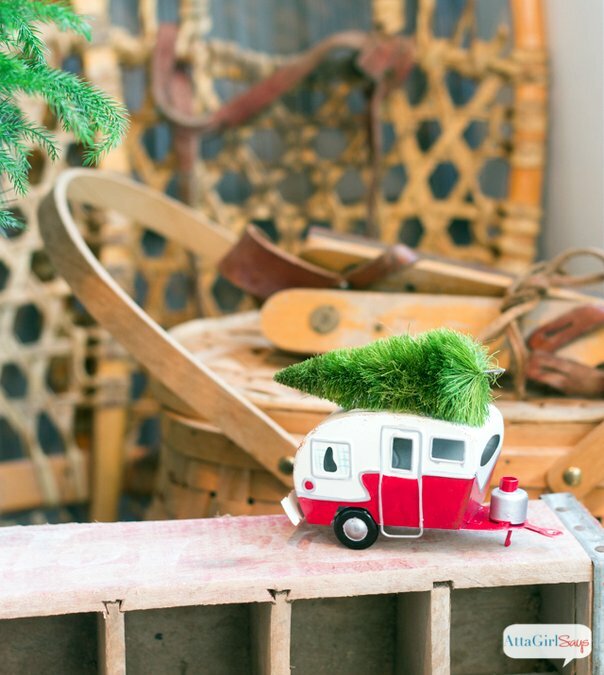 If you look closely (and in the pics below) you can see two of our favorite things: vintage ice skates and an adorable Christmas ornament of a retro trailer. So here is that adorable Christmas ornament: a retro trailer, so vintage and red. Perfect little decoration for the porch. 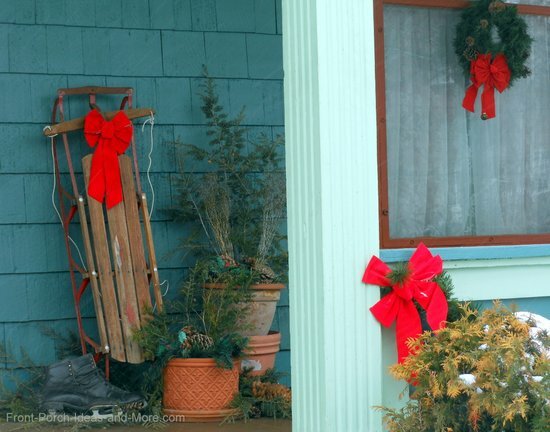 We've also seen some porches with cute toy trucks that are decorated with greenery for Christmas. You could load tiny pine cones onto the back of a toy pickup truck. Then there are these ice skates - perfect for vintage Christmas decorating. You can tell that these skates probably hold lots of memories. 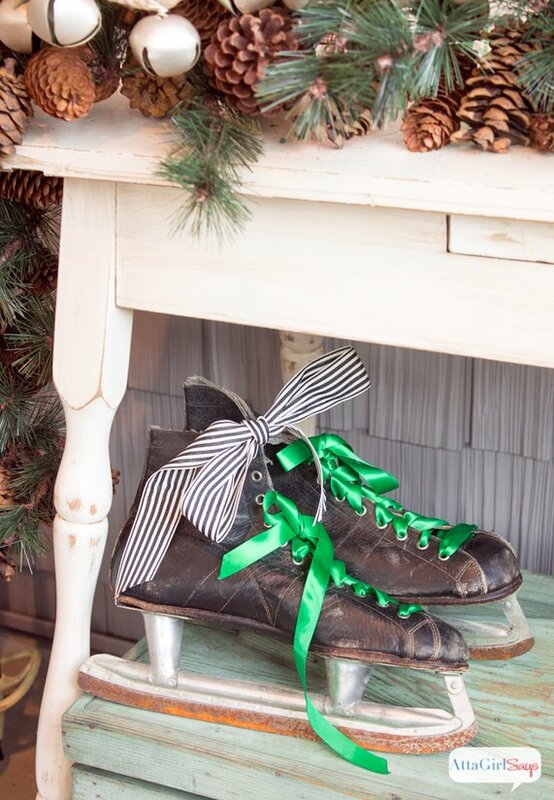 Love how Amy tied the skates with pretty Christmas ribbons. Quite a nice touch. 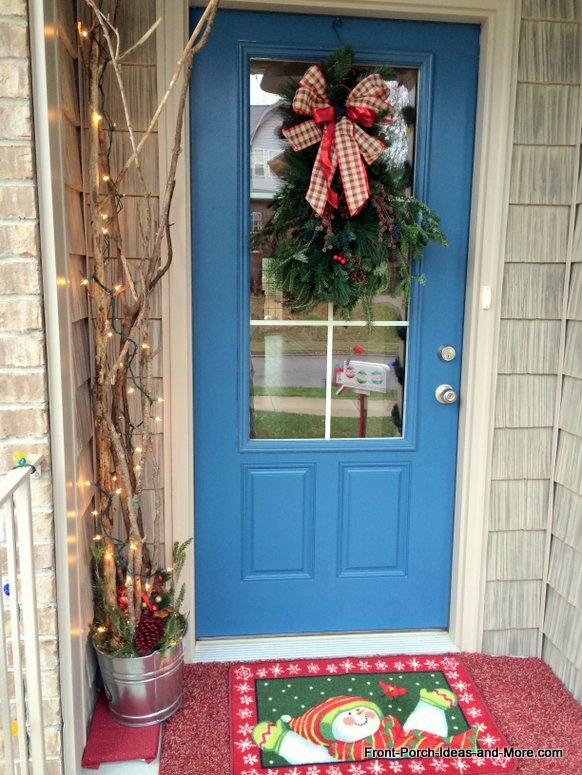 If you enjoy Amy's Christmas porch, we bet you will also like her autumn porch, too! 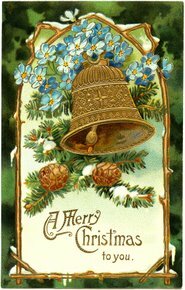 We invite you to visit Amy's blog, AttaGirl Says, to see more pictures of her vintage Christmas porch. We know you will love it. Amy is a crafter, DIYer, cook, writer and mom who dabbles in many things! 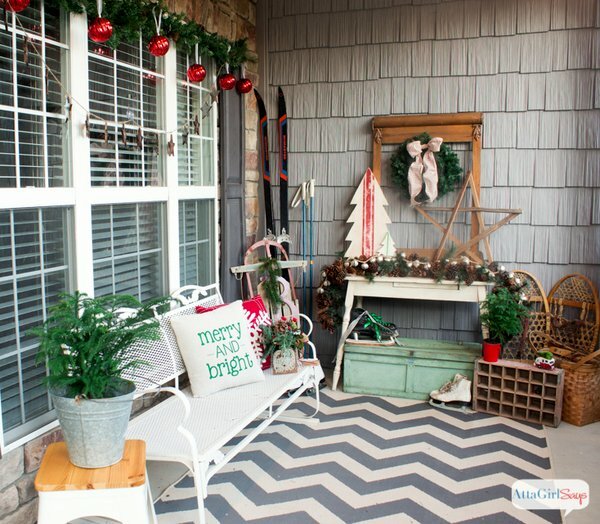 Kelly, a lover of vintage, displays a vignette on her porch: a vintage galvanized bucket filled with greenery and set atop soft drink crates and a sled adorned with greenery. What a charming display that is both fun and perfect for conversation starters! As the writer of Eclectically Vintage, Kelly loves thrift shops, collections of nifty items, old silver, pretty much anything that is vintage. Please stop by to say hello and see more of her wonderful porch and home! 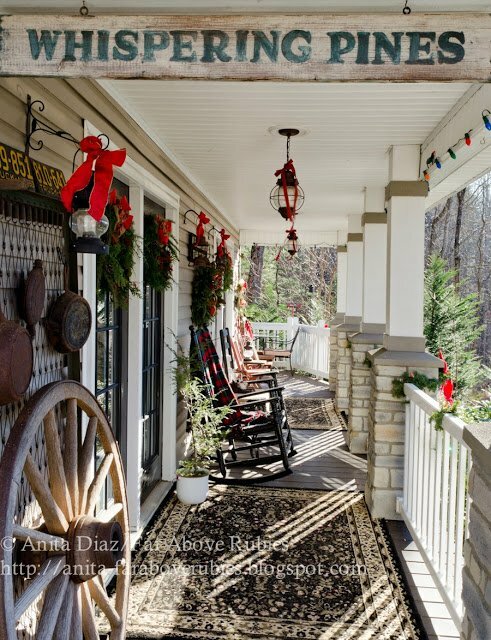 Anita's country home is in the mountains of North Carolina. 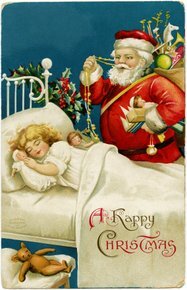 She treasures her family's heritage and remains true to their rich history by lovingly decorating with family treasures. Look at the old license plates, cast iron skillets and wagon wheel she displays. Also notice the wonderful "Whispering Pines" sign that her grandfather left on their property. 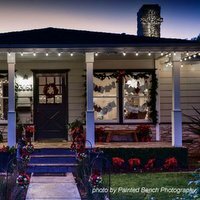 For Christmas, she has fresh greenery with bright red bows across the back wall of her porch and an old-fashioned colorful string of lights gracing across the porch. 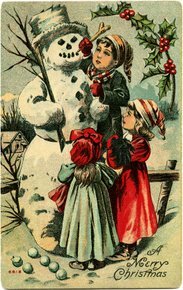 We bet you'd love hearing the podcast where Anita shares her country Christmas traditions with us. 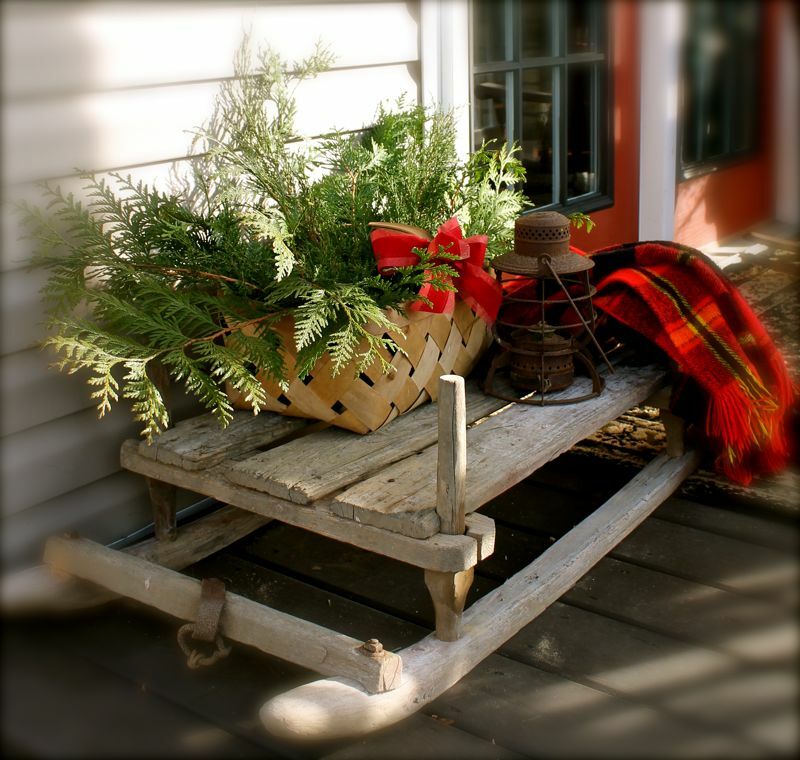 This vintage sled belonged to her grandfather and the bright red plaid poncho belonged to her grandmother. We spy an old lantern, too. These treasures mean a great deal to Anita and her family so they are incorporated into their Christmas decorating. Beautiful! Taking a peek inside Anita's home - isn't it decorated most beautifully for Christmas? 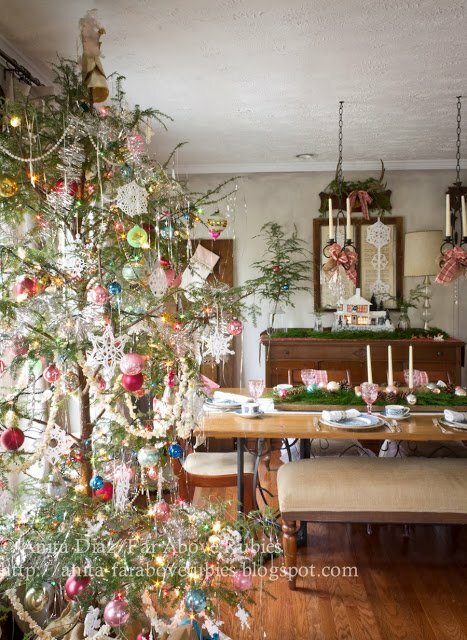 Look at the sweetly decorated tree with crocheted snowflakes and vintage glass ornaments in pastel colors. You can visit Anita's blog, Far Above Rubies, to see more of Anita's lovely home, filled with family treasures and lovingly decorated. Taking a walk in Westerville, OH, Dave and I came across this lovely green American Foursquare all decorated for Christmas. We got to meet the kind homeowners, Len and Doris, who had restored the inside of their home as well. Freshly baked cookies were cooling on the kitchen table and I was in awe with the woodwork and lace curtains. It was like being at Santa's home; yes, quite like that. 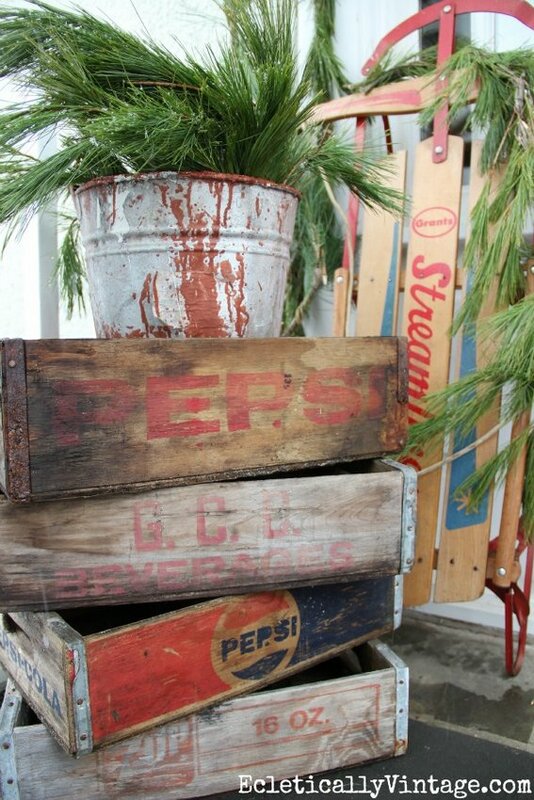 A close-up of the vintage sled and ice skates vignette they had on their porch. And it was even snowing! Magical. Please read the intriguing story of Len and Doris' American Foursquare home and about the wagon rights they still have. 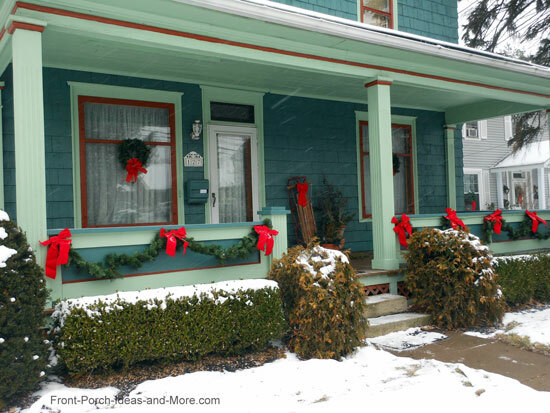 A jewel-toned Christmas on Dawn's porch. So vintage and pastel - it's a joy to see! 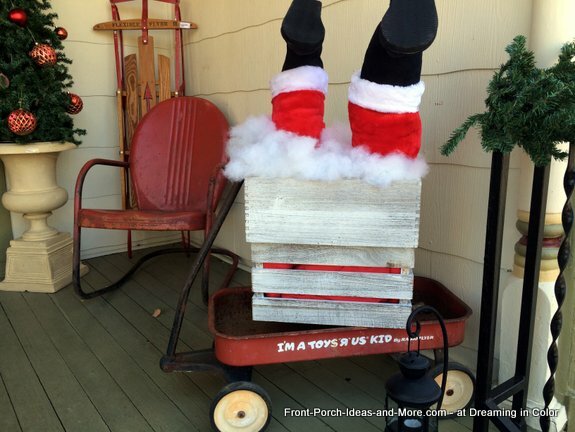 If you like what you see here, you will enjoy the interview we did with Dawn about decorating her porch as well as seeing more of Dawn's Christmas porch. 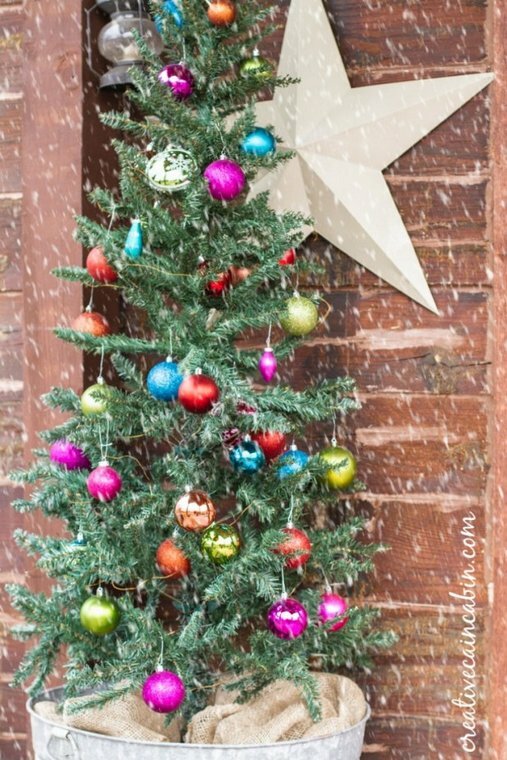 Now you can see how cute the vintage-style tree is on her front porch! Love all the little extras, too! 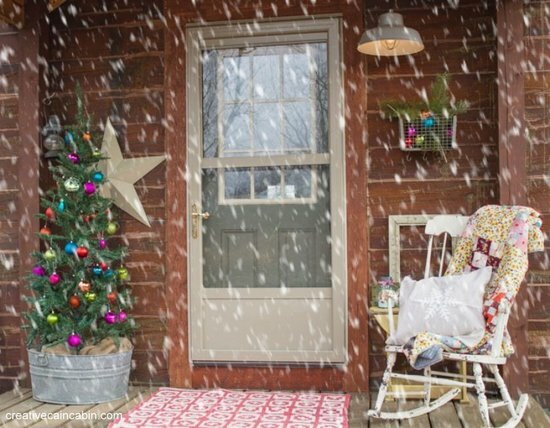 Dawn is the author of Creative Cain Cabin where she blogs about country living and DIYs in her log cabin home. We love her style! Please stop by to visit and say hello. 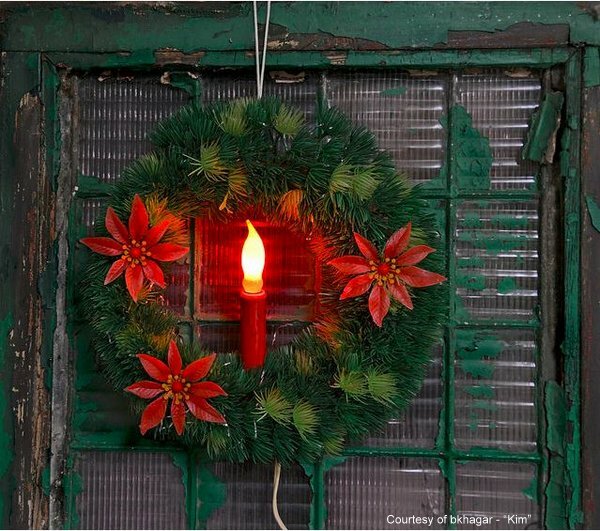 Kim found this vintage Christmas wreath at an estate sale and brought it home to mount atop an old window. Perfect union and how neat that the candle still works. What a find for a vintage lover! Kim very much enjoys photography, prose and art among many interests. She's a geekgirl - having worked in the computer field for most of her career. Kim says that she and her husband have a "veritable zoo of animals". They rescue cats and birds plus they have three little dogs, a few turtles and a rabbit. You can enjoy Kim's photo stream on Flickr. 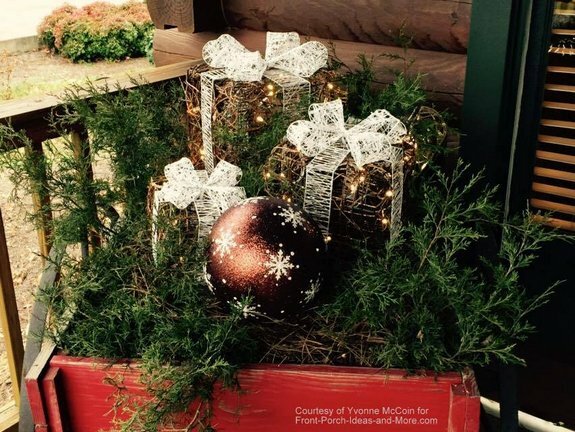 An adorable vintage red wagon on Yvonne's log cabin porch is filled to the brim with evergreen and over-sized ornaments. So sweet. We are appreciative that Yvonne shared her photo with us. Want to see more of Yvonne's back and front porches? 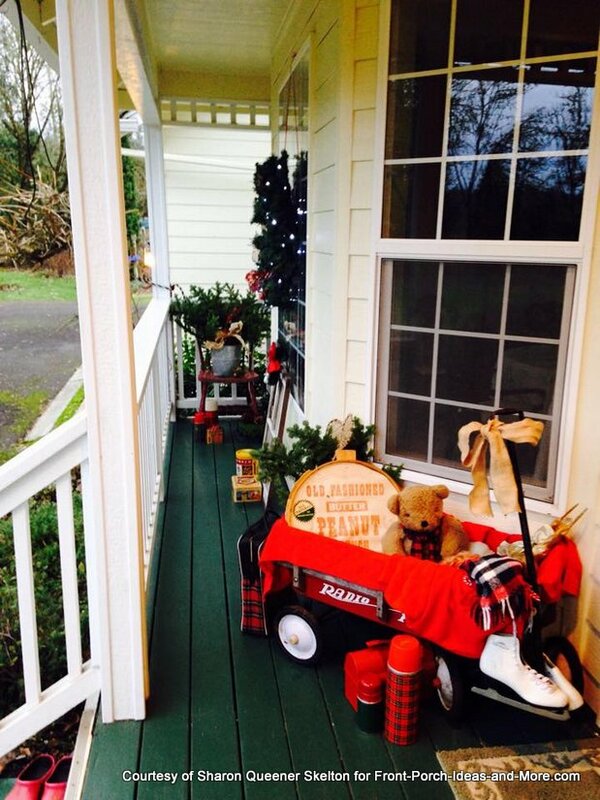 We love the way Sharon displays a red wagon filled with old tins, skates and a soft teddy bear. Anyone remember having a lunch box or thermoses like that? We do. We thank Sharon for sharing these great photos with us. Such an old-fashioned wreath in shiny pastels and baubles. We saw this beauty at Deneen's shop, Dreaming In Color, in Murfreesboro TN. Deneen is super creative and created this Santa going down the chimney. Isn't it sweet and so vintage? Enjoy more pictures of Deneen's porch and delightful shop where we feature Dreaming In Color - which is located in Murfreesboro TN. Thank you! 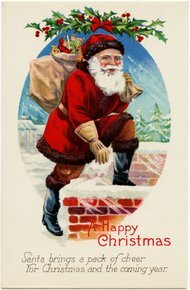 Here are a few vintage Christmas postcard images that would make wonderful ornaments, gift tags, cards, you name it. You can find larger sizes on her website. Julie is kind to share them! Did these vintage images inspire you in some creative way? Last year on our Christmas porch, we decorated with bare branches with white lights, simple and vintage-y, and put them next to our front door. 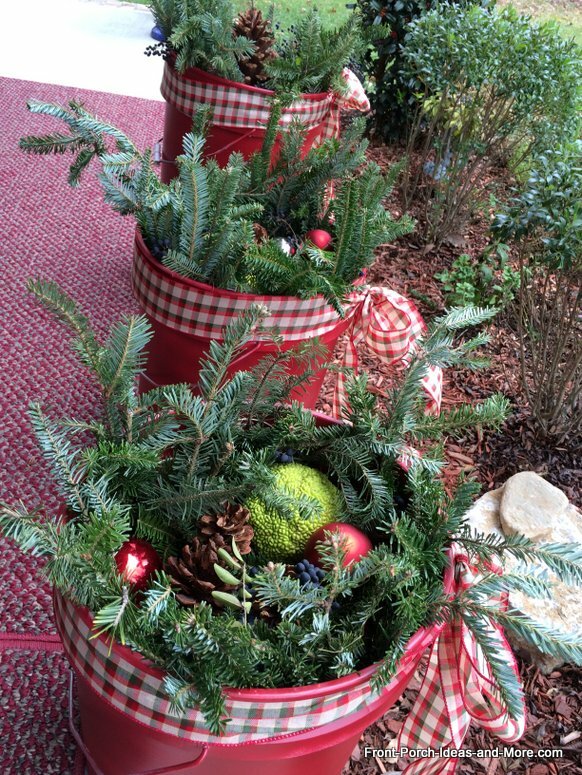 Last year on our Christmas porch, we made ornamental buckets filled with natural elements we found in the wood: osage oranges (also called hedgehog oranges), pine cones and berries. We also added a few bright red ornaments we had on hand. Top view of these pretty buckets on our porch. They got lots of compliments! 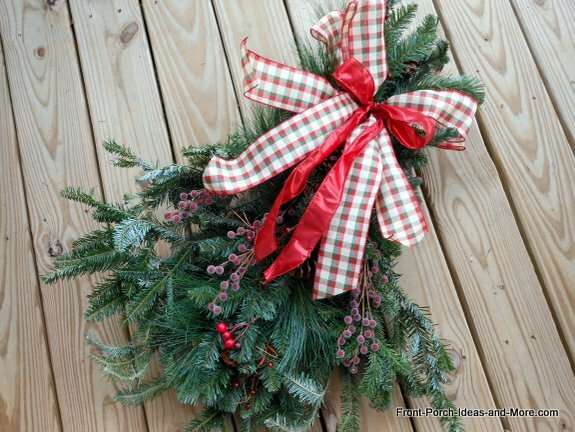 By combining similar elements, fresh greenery and ribbons, you can create a lovely evergreen swag to grace your front porch. You can get greenery where they sell fresh Christmas trees. Lastly, we wanted to show you the elements we used to create a real old-timey Christmas wreath for our front door. We added frostly garland, aqua snowflake ornaments, a vintage ornament and burlap and shimmery ribbon to a grapevine wreath. 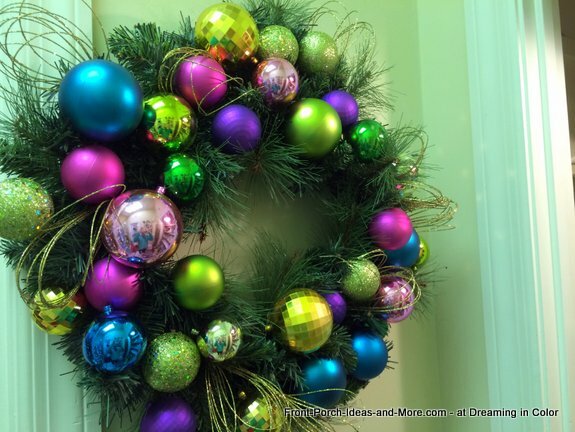 We think you will like to see the nostalgic Christmas wreath we created from these materials! 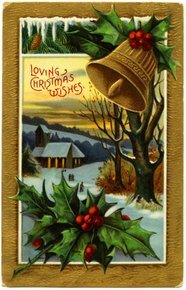 We hope our vintage Christmas decorating ideas will inspire you to decorate your front porch for Christmas with treasures you might already have. Vintage decorating is from the heart! Check out the beautiful Christmas light displays. Photographers share their gorgeous photos!